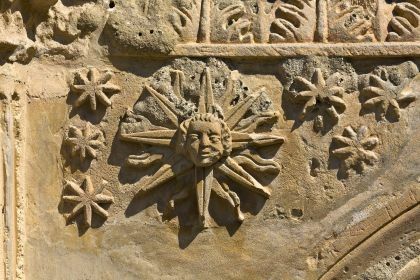 Zakynthos is also one of the two Greek islands (Rhodes is the other one) with the highest, year-round duration of sunshine. Zakynthos, the third largest island in the Ioanian Sea, is only ever described in superlatives. 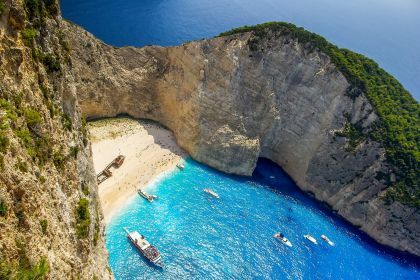 Its famed beach, Navagio, is consistently rated as one of Europe’s best – including by the respected Condé Nast Traveler – and is one of the most photographed spots in the Mediterranean. 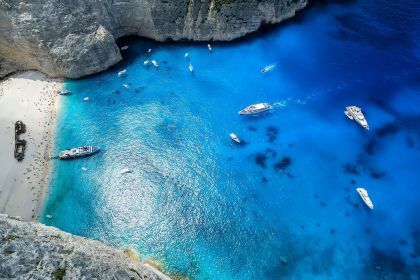 One of Zakynthos’s most appealing aspects is that it is easily accessible by yacht. Larger passenger liners are able enter the bay but cannot approach the beach due to weight restrictions. A luxury yacht will not only solve this problem but ensure a degree of privacy and exclusivity that is tough to beat. Some of the Mediterranean’s deepest spots — in some cases 4000m deep — are found in the Ionian Sea, making it a paradise for diving aficionados. The south-east of Zakynthos is home to many of these. Octopus and Barracuda Reefs, the Arch of Triumph and the Keri caves are just some of the renowned spots. The water is luminous, allowing for a high degree of visibility and a treasure of delights waiting to be discovered. Another highlight is the Blue Cave, an electric-blue wonderland, especially in the early mornings. Small boats can easily access the cave or you can simply swim in and enjoy some unsurpassed snorkelling. It can get busy though, so if you prefer your water adventures more tranquil., try Limni or Keri caves. You will be dazzled by marine life in technicolour: trevallies, sea breams, octopi, moray eels, and an array of exotic tropical fish. 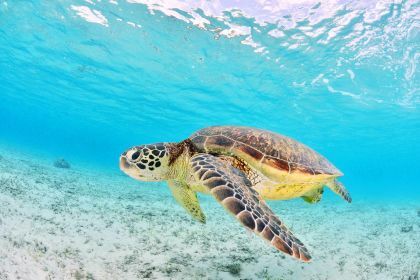 You might even be lucky enough to spot some turtles, for which the area is known. Be sure to also sample some of Zakynthos’s famed wine, or take a few bottles home as a souvenir. Currants and strawberries are other natural products for which Zakynthos’s is celebrated. You will find finger-licking desserts containing these delights in many of the stores and local tavernas. Vasilikos boasts some exquisite beaches, such as Gerakas and Banana, known for their natural beauty and tranquility. Gerakas also draws scores of turtle fans as it is a famous turtle-nesting spot. 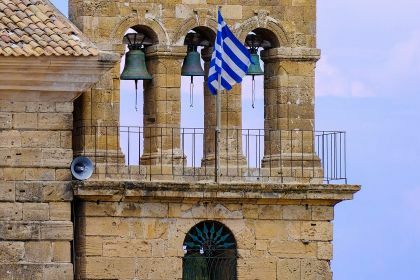 With one town, Zakynthos itself, and around 44 villages, there is a plethora of traditional food on offer, be it rustic or gourmet. Zakynthians are proud of their cuisine. Think fresh, organic, home-grown ingredients in typical Mediterranean dishes — all lip-smackingly fresh and authentic. 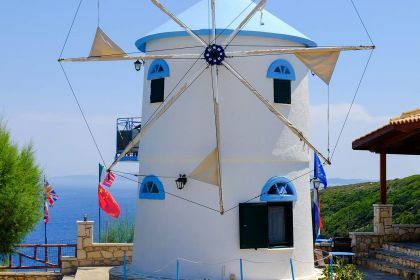 Head to Kalamaki for some of the best eateries, including Massa Mediterranean Cuisine and Essence Restaurant, to sample some traditional fare. Insider tip If you are a fan of more structured entertainment offerings, head to Tsilivi in the east of the island. This settlement has a golf course, Splash Fun water park, a ceramic art studio and a branch of Relax Spa & Beauty. Just the thing for a fun-filled family break. You can call us or leave your charter enquiry here and we’ll make sure you get the most from your yachting holiday. We are here to help you plan every last detail of your memorable island-hopping adventure.